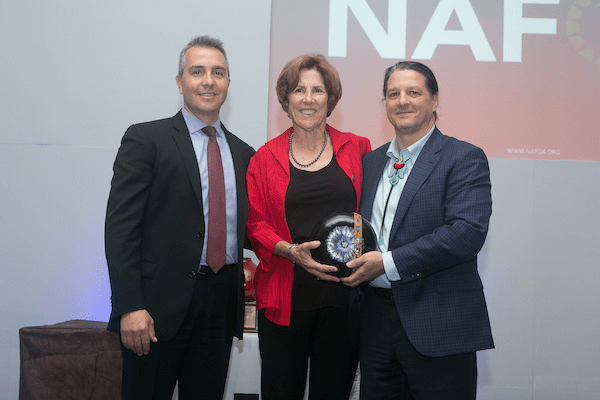 The Native American Finance Officers Association (NAFOA) honored Kathleen Nilles at its 11th Annual Leadership Awards Luncheon for her years of service to Indian Country. The luncheon, held on April 24, 2018, was hosted at NAFOA’s 36th Annual Conference in New Orleans, LA. NAFOA recognized Nilles for her many accomplishments as a partner at Holland and Knight and as a leading figure in the field of taxation. Through her years of dedicated service to the NAFOA community, Nilles provided steady guidance to many of NAFOA’s projects and advocacy efforts. Early in her career, she began to combine her tax attorney experience with a sympathetic understanding of tribal governance to offer important outreach on topics related to tribal economic development. Nilles’s expertise in taxation and business structure has helped many tribes think about strategic plans for their advancement as sovereign communities. Nilles co-authored a NAFOA publication – the Tribal Business Structure Handbook, which remains a best seller for NAFOA. She also offered insights and directions to tax-related chapters in the Financial Reporting and Information Guide for Tribal Governments and Enterprises. Both publications have and will continue to influence decision making in all areas of operations. Nilles has been a devoted advocate in tribal government legislative issues, an expert voice on NAFOA webinars and conference panels, and most recently a NAFOA education supporter. As a partner in the Washington, D.C. office of Holland & Knight, she focused her practice on resolving critical tax and business organizational issues for tax-exempt and governmental entities. She was a leader in the arena of federal tax policy and expert of legislative issues for a diverse group of organizations, companies, and governmental units. Nilles has over 20 years of experience advising tribal governments and tax-exempt hospitals on tax issues. Her other professional recognitions include being listed as one of America’s Leading Business Lawyers from Chambers USA and Best Lawyers in America from Native American Law. NAFOA wishes Kathleen Nilles the best of luck for a well-deserved retirement.